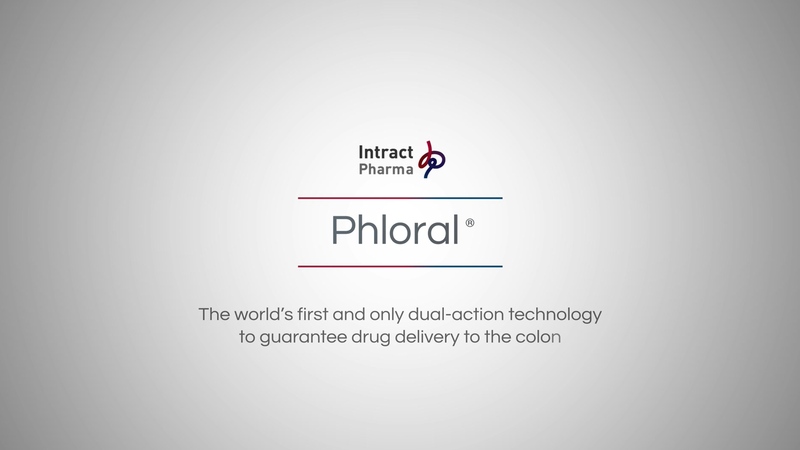 Phloral® is a cutting-edge technology for precise and consistent delivery to the colon. It exploits changes in gastrointestinal pH in combination with the enzymatic activity of the microbiota as independent but complementary release mechanisms to guarantee site-specific release. Even if the pH in the GI tract varies, the polysaccharide component is independently digested by enzymes secreted by the trillions of bacteria naturally residing in the colon. This additional fail-safe mechanism overcomes the limitations of conventional polymer coatings. Phloral® was evaluated against a widely used conventional pH sensitive coating in 8 human subjects. 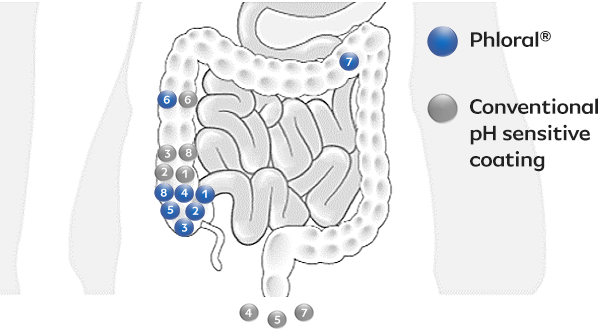 Radiolabelled tablets were administered under various feeding regimens. Transit and disintegration was tracked by gamma scintigraphy. Tablets illustrate the site of disintegration in individual subjects. Data reported in the fed state. Conventional tablets remained intact in subjects 4, 5 and 7 and passed out in the stools.